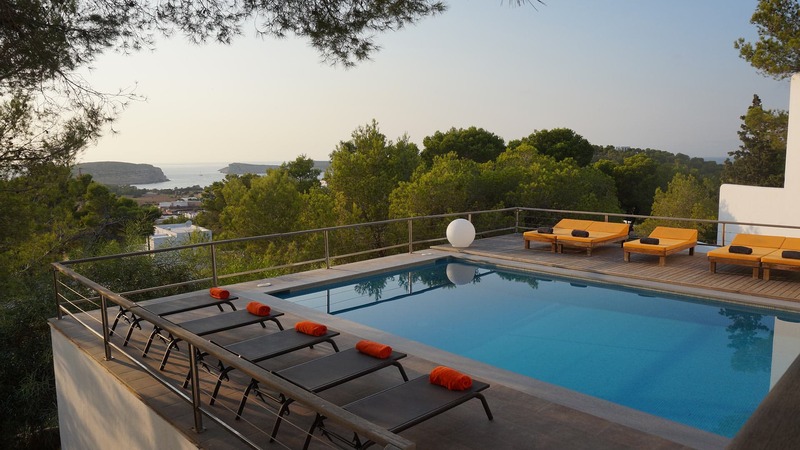 Superb villa located on a promontory, in a very quiet subdivision overlooking the bay of Cala Conta. Direct view of the most beautiful sunsets of the island or, through the reflections of a wall mirror having been impregnated by the mark of time and spray. Room, Ground level, direct access to the terrace. Bathroom ensuite, with bathtub, shower. separate WC room. This bedroom includes also dressing room. Room, Ground level. Bathroom outside the room, shared, with shower. separate WC room. Room, Lower floor, direct access to the terrace. Bathroom ensuite, with shower. Large living room with fireplace, satellite TV, Hi-fi. Direct access main terrace. Full kitchen, open to the living room (fridge, dishwasher, microwave, gas hob ...). Direct access terrace with veil cover, converted into an outdoor dining room and pool terrace. Reserve with washing machine, dryer and large fridge-freezer. Main terrace with private pool of 5mx12m. Solarium terrace with sun loungers and breathtaking panoramic views. All the most beautiful beaches of the west coast are within a radius of maximum 10km. The beautiful beach of Cala Conta, is less than 2 minutes by car. Cala Tarida where are our local offices, is 5 minutes drive and Ibiza town 20km. Luxury villa, and modern style, completely redone in 2010 with an unusual situation. Great views of the sea and the islands Bledas, Espartar, Bosquet, and Conejera. plage un peu trop éloignée.